LiveBetterGarden.com: Pepper leaves are pale, curled up and have dark spots. Infested with aphids. What to do? Pepper leaves are pale, curled up and have dark spots. Infested with aphids. What to do? 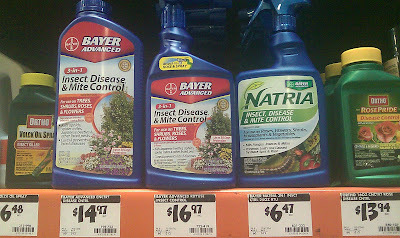 I bought this pyrethroid-based spray from Home Depot: Bayer Advanced 706120A NATRIA Insect, Disease and Mite Control Ready-to-Use, 24-Ounces for $6 ($11 at Amazon). 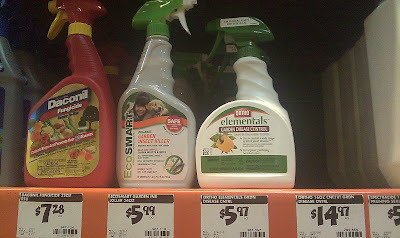 The product is a contact killer for both insect and mite pests. It also supposedly controls a wide range of fungal diseases and pests. For use on Roses, Flowers, Houseplants, Ornamental Trees and Shrubs, Fruits, Nuts and Vegetables. It kills: Aphids, Mites, Spider Mites, Leafhoppers, Caterpillars, Rose Slugs, Whiteflies, Spittlebugs, Mealybugs, Scale, Thrips, Psyllids, Plant Bugs, Lace Bugs, Fruit Flies, Chiggers and Earwigs. It controls: Black Spot, Powdery Mildew, Rust, Scab, Blight, Brown Rot and Leaf Spot. It can be used up to the day before harvest. Pyrethroid is an organic compound similar to the natural pyrethrins produced by the flowers of pyrethrums (Chrysanthemum cinerariaefolium and C. coccineum). Pyrethroids now constitute the majority of commercial household insecticides. They are generally harmless to humans. They are usually broken apart by sunlight and the atmosphere in one or two days, and do not significantly affect groundwater quality. Pyrethroids are very popular insecticides because exoskeletons of insects are sufficiently porous to pyrethroids. They are axonic poisons and cause paralysis of an organism. The chemical causes paralysis by keeping the sodium channels open in the neuronal membranes of an organism. When the toxin keeps the channels in their open state, the nerves cannot de-excite, so the organism is paralyzed. Pyrethroids are usually combined with piperonyl butoxide, a known inhibitor of key microsomal oxidase enzymes. Piperonyl butoxide prevents the insect's enzymes from clearing the pyrethroid from its body, maximizing the lethality of the pyrethroid.